Co-authors of the book Noire N’est Pas Mon Metier (Black Is Not My Job) pose on the stairs at the screening of Burning during the 71st annual Cannes Film Festival at Palais des Festivals on May 16, 2018, in Cannes, France. 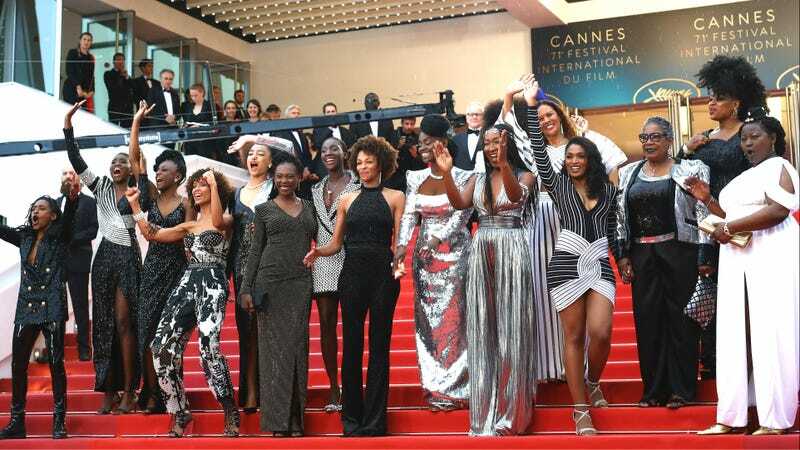 The red carpet at the Cannes Film Festival got even more colorful Wednesday as 16 black and biracial actresses staged a very glamorous protest on the steps of the Palais des Festival convention center. Dazzlingly dressed in black, silver and white by Balmain wunderkind Olivier Rousteing, actresses Nadège Beausson-Diagne, Mata Gabin, Maïmouna Gueye, Eye Haidara, Rachel Khan, Aïssa Maïga, Sara Martins, Marie-Philomène Nga, Sabine Pakora, Firmine Richard, Sonia Rolland, Magaajyia Silberfeld, Shirley Souagnon, Assa Sylla, Karidja Touré and France Zobda braved the rain to make a statement about the pervasive racism and sexism in the French film industry. Co-authors of the book Noire N’est Pas Mon Metier (Black Is Not My Job) pose on the stairs of the Palais des Festivals convention center during the Cannes Film Festival on May 16, 2018, in Cannes, France. The 16 actresses are the authors of the recently released essay anthology Black Is Not My Job (Noire N’est Pas Mon Metier), in which each details the casual racism she has repeatedly experienced from French casting agents and directors. Together, they have also formed the #DiasporAct collective to try to change the representation and opportunities available to black actresses in French cinema. Between the maids and prostitutes roles I’m offered, for which the “African accent” is required, there seems to be a new genre in cinema: the “less than life, next to nothing.” In short, movies that are under reality, where no black woman can be crazy in love with someone, be a doctor or a lawyer. Where are we, and what year is this? Bamako actress Aïssa Maïga, who is credited with leading Wednesday’s protest and spearheading the book project, told Agence France-Presse, “I was moved to act by the spirit of the times.” The actress also said that though likely to face opposition, measures such as inclusion riders “could be a possible option” to increase the visibility and representation of black women on-screen. This demonstration follows a historic protest Saturday, where 82 women active in the film industry, including Cannes jury members Ava DuVernay and Khadja Nin, protested the lack of female filmmakers chosen to compete in the now 71-year-old festival.